A rally for the release of kidnapped schoolgirls in Lagos, Nigeria, on Sunday. Update (May 16, 3:45 p.m.): This post should refer to media reports of kidnappings, not kidnappings. Please see the editor’s note we issued on a related article. Three weeks ago, more than 300 teenage girls were abducted from a school in Nigeria. In a video released Monday, the leader of an Islamist militant group called Boko Haram took responsibility for the kidnappings, describing the girls as “slaves” who would be sold. Details about the mass kidnapping have been sparse and confusing; police initially claimed that 100 girls had been taken, but they now say 276 remain captive and 53 have escaped. Boko Haram claims that two girls have died and 20 are ill.
Events were unfolding at a rapid pace — while I was writing this, there were unconfirmed reports that eight more girls had been kidnapped — so, in an attempt to understand a story that seems as surreal as it is tragic, I looked into the history of kidnapping in Nigeria. My starting point for this wasn’t Nigerian national crime statistics. That wasn’t just because the portal was down; it was mainly because Nigeria is ranked 144th out of 177 countries on transparency and anti-corruption policies by Transparency International. Instead, I’m using GDELT, the Global Database of Events, Language and Tone, an enormous catalog “of human societal-scale behavior and beliefs across all countries of the world.” There are copious types of “behavior” it records, including protests, deportations, assassinations and kidnappings (technically, events categorized as “abduct, hijack, take hostage”). GDELT is updated daily using thousands of broadcast, print and online news sources in more than 100 languages, and includes events back to 1979. We were able to extract every Nigerian kidnapping in the database over the past quarter-century — 25,247 in all. GDELT’s data shows that the number of kidnappings over the past three decades has risen from just two in 1983 to 3,608 in 2013. It’s an increase so large that it’s probably not solely the result of better reporting or the rise in (and online availability of) news reports on the topic. There have been 2,285 kidnappings in Nigeria in the first four months of 2014, according to GDELT, suggesting that the problem is worsening. The recent mass abduction of schoolgirls took place April 15; the database records 151 kidnappings on that day and 215 the next. When the information is known, the database shows where the event took place and which actors (police, terrorists, military, army groups, etc.) were involved. We’re continuing to analyze the data, so let us know if you have questions you want us to look into. You rarely want to plot raw numbers of events, since global news volume available in digital form has increased exponentially over the past 30 years (it increases by a fraction of a percent each day), meaning the total universe of events recorded in the news and available for processing has increased exponentially over that time. Instead, you want to divide the total number of what you are after (kidnappings in Nigeria) by all GDELT events for a given time period to get a normalized intensity measure. That methodology still doesn’t account for whether the media have suddenly become more interested in a specific topic or region over time, but it’s better than what we originally had. So we followed the advice. This is what that kidnapping chart looks like when accounting for the total volume of events in GDELT. It’s similar to the first chart, with the exception that a few earlier dates appear more significant. 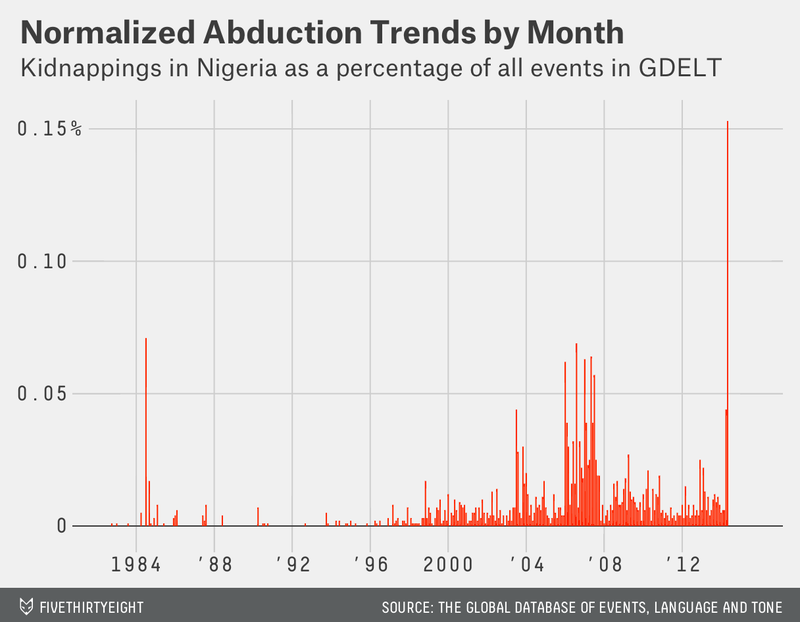 For example, Nigerian kidnappings in July 1984 accounted for 0.07 percent of all events recorded that month, whereas the raw data seemed less significant (there were 49 kidnappings reported that month, but spread out over 12 days). 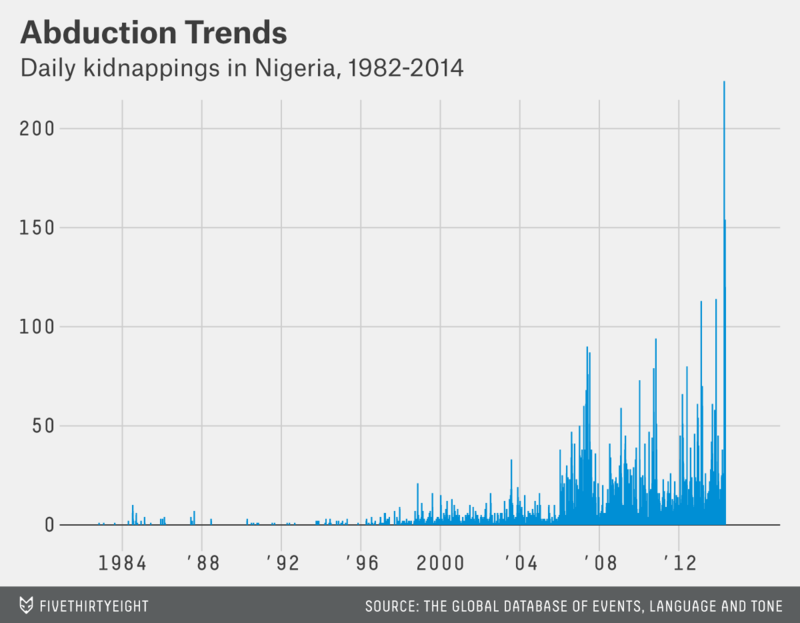 Whichever way we look at it, the latest rise in kidnappings in Nigeria seems historically significant.